Every year, on the second day of February, humans emerge from their dens around sunrise to see what a sleepy, nine pound squirrel has to say about the upcoming weather forecast. If you ask the Punxsutawney Groundhog Club, the same old Phil has been calling the weather like he sees it for the past 129 years. But why do we celebrate Groundhog Day anyway? It seems a little silly to take wardrobe advice from a celebrity rodent, especially a rodent who is literally wrong more than half of the time. The origins of this hilarious tradition can be traced to a couple of different beginnings. The Celtic festival of Imbolc, which traditionally falls on Feb 1, relies on hibernating animals to predict the arrival of spring based on the same Groundhoggy shadow lore. The story goes that on a sunny Imbolc, a wise fairy goddess uses the bright sun to collect firewood for the impending six more weeks of winter, though if it's cloudy, she sleeps in. That's just what wise women do when it's gloomy outside, right? The German tradition of Candlemas is also an important ancestor of the Pennsylvania tradition. Candlemas is a Great Feast of the Eastern Orthodox Church which falls on Feb. 2, and also relies on the relative gloominess of the day to predict the arrival of spring. 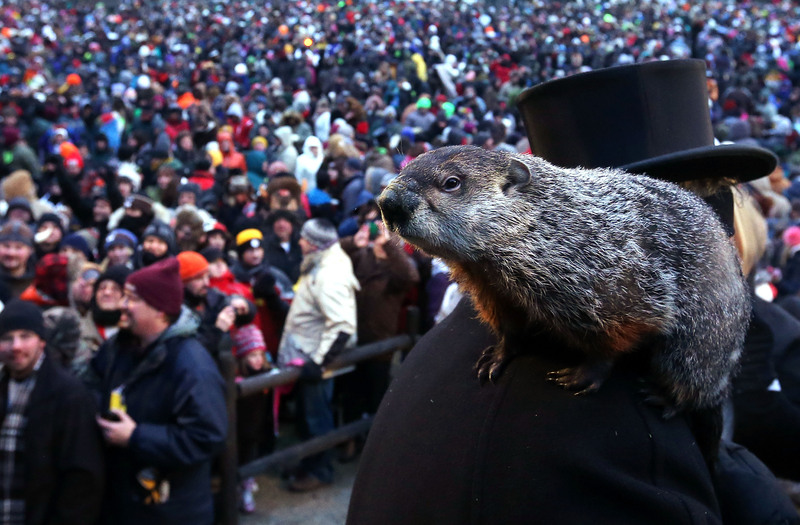 Here are six more facts that you may not know about Groundhog Day and Punxsutawney Phil. So, in the wild, groundhogs peek out of their dens around the beginning of February to make sure their mates haven't wandered off while they were taking a long winter's nap. It's basically the "you up?" text message of the animal kingdom, after which the groundhogs go back to sleep for about a month before mating season kicks into full gear. Every summer, Punxsutawnians throw Phil a picnic at which they feed him the "elixir of life," which is actually made from fruits, vegetables, and strawberry Kool-Aid. Apparently this smoothie gives Phil an extra seven years of life — which is the average lifespan of a groundhog, if you were wondering. The official word from the Punxsutawney Groundhog Club is that there's only one Phil. But if strawberry smoothies kept you young forever, I wouldn't be finding grey eyebrow hairs, now would I? This groundhog doesn't even have to hibernate as he lives in a posh climate controlled den affixed to the Punxsutawney Public Library where you can visit and see what he and the wife have done with the place. This groundhog has a 50/50 shot at guessing correctly, and he still can't get to a .500 winning percentage. I'd probably just look up the forecast on my phone.